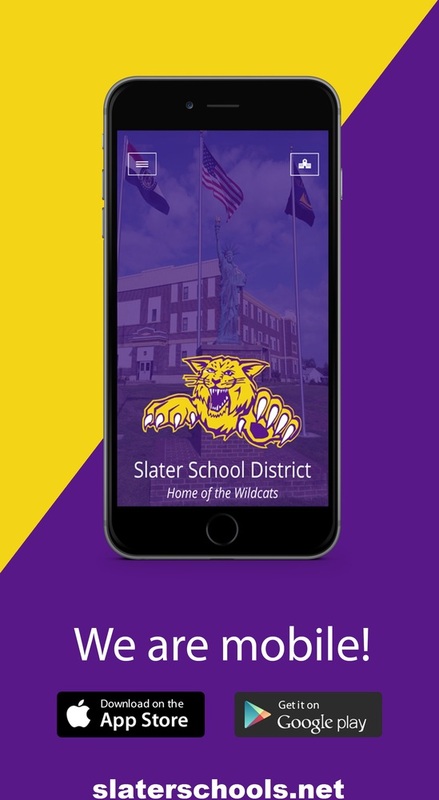 Slater School District is proud to announce the launch of a new, redesigned website and app for use on mobile devices. Some features of the website include a centralized location for calendar events, current news, social media posts, cafeteria menus, and a staff directory. "We have our main district site as well as a site for district activities, like FFA, band, and sports," said High School Counselor Jessica Clements. The activities site will mimic the main district site, hosting calendar events, schedules, results, rosters, and more. "We're envisioning the site being a tool for the school and the community," Clements said. "Staff has the ability to post information as it's happening, without having to wait for a designated person to have the time to post." Clements said that the fact that users can see the posts in real time makes it a more relevant experience and tool. The website address is slaterschools.net. Some features of the mobile app include the same features as the website, plus turn-by-turn directions for away events as well as interactive features where users can report a concern, praise good things that they see happening, volunteer, and ask a question. "The app makes the features of the website - plus more - available wherever our Wildcats are," said Clements. The app features information for the district as a whole as well as activities. The app is available as a free download in the Google Play and iTunes stores by searching for 'Slater School District'. "Great things are happening at Slater Schools, and this makes it that much easier for everyone else to see what we see on a daily basis," Clements said.